The final collection for D&G sends out many statement making pieces down the final swan song for the brand. Silk scarf prints were the inspiration for SS2012. These fine intricate patterns were plastered all over shirts, trousers, distressed shorts and even footwear, creating a refreshing direction to modernise silk foulard prints. One of the pieces I have been eyeing is this Denim Shirt with the silk print panels on the shoulders. 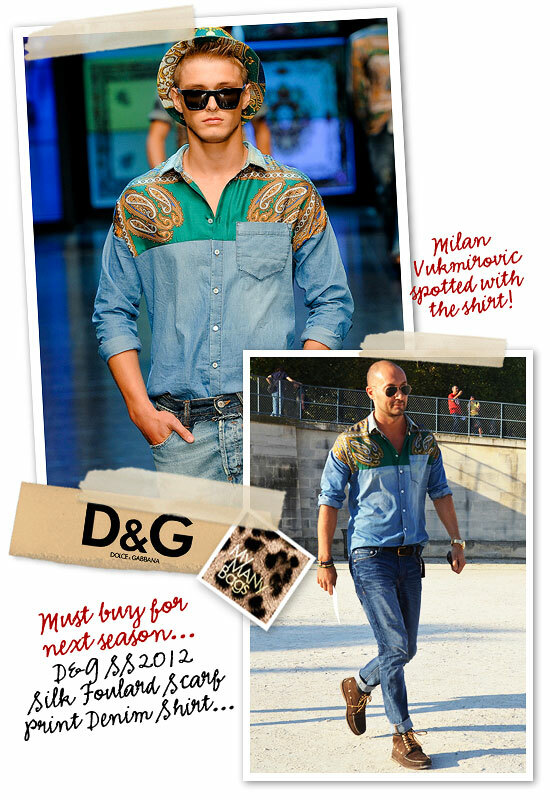 Now made even more desirable after seeing Milan Vukmirovic (my style idol) wearing it during the recent fashion week. How could you not love something so rugged and casual, given a step up the cultural ladder, ala Baroque style? A more playful take on Versace? Anyhow, the shirt just flew right to top spot for my SS2012 wishlist.